DID YOU KNOW?? : You have the freedom to speak up and choose your own methods of health, healing, and wellness. Yes, it’s true. When I began my cancer journey, the moment I received that life-changing phone call from the oncologist, it was my choice to follow the doctor’s orders or to make informed decisions. It was my choice every step of the way; from agreeing to the surgery, to the protocol I would follow to fight off the cancer, to recovery. But I didn’t know that at the time. It was a gradual learning process, with incredible support from people I trusted, who had been there before and were thriving and healthy on the other side. We are taught as a society that we don’t do anything about our health until it’s compromised. THEN we act. Headache? Take a pill. Anxiety? Take a pill. Muscle pain? Take a pill. Sick? Knock yourself out with some liquid drugs until it passes…and take another pill. Of course, if all else fails, you make an appointment to see the doctor, who prescribes…more pills. We have been a very medicated society as a whole. But when you decide to take control of your health, to pay attention to your body and figure out the underlying causes of these illnesses, aches, and pains- and then choose to support and boost the systems that were created to fight off disease or heal the injured or malfunctioning parts…our bodies have the amazing ability to work WELL. And suddenly, you aren’t relying on the pills anymore. I had friends who showed me a better way when I felt so overwhelmed. And I wanted to just throw it out there for anyone who might be in a desperate place for themselves or for a loved one. Listen: YOU HAVE A CHOICE. You don’t have to just “do what the doctor says” and hope for the best. There can be a positive outcome to your story. You have the ability to research, engage, and make informed decisions about your own health & wellness, if you’re willing to exercise your freedom. As a part of that freedom, I use essential oils. I was introduced to these plant-based drops before my surgery, and was amazed at how powerful and effective they were in calming and pain-killing. Now, I work them into my daily routines, research them constantly, share with people I love, and recommend them wholeheartedly. They are an all-natural way to provide support (along with good, researched nutrition and staying active) to the immune system, enhance healthy cell regrowth through increased oxygenation (**increased oxygen = cancer killing**), and have a myriad of uses- from replacing your over-the-counter drugs, to flavoring your food. I’ve seen tremendous results in my overall health & wellness, and there is plenty of reputable information to back my own experiences. 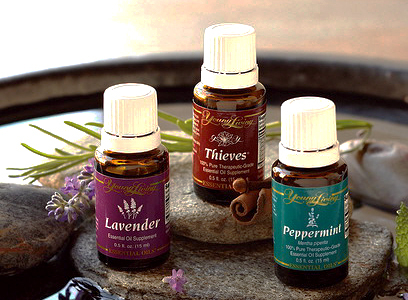 Young Living Essential Oils are my preference (and yes, I am a distributor, so feel free to ask me about them! ), but DO YOUR RESEARCH. Make informed decisions about your WHOLE self- body, mind, and spirit. We miss the point when we just medicate for a symptom. The cure lies in finding the CAUSE of the symptom, and working from the ground up for total healing. It’s time to take charge and believe there’s a better way to live healthy, happy, and whole. Let’s turn over a new leaf of thought about our bodies and how we treat them as we go forward. I guarantee it’ll be one of the best things you ever did for yourself- and for those you love!